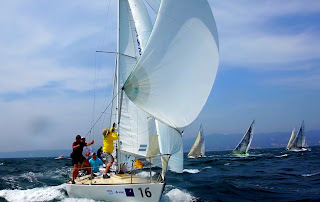 In Riviera Nayarit luxury is our adventure, which has become the main attraction to the sailing sports fans that recognize Mexico’s Pacific Treasure as one of the best destinations for the practice of these sports. Therefore, Riviera Nayarit started the works on the upcoming Regatta Copa Mexico this July by meeting with Peter Wiegandt, the new President of the organizing committee. Last June 15th 2012 Governor of Nayarit Roberto Sandoval announced Regatta Copa Mexico would come back to Mexico’s Pacific Treasure on 2014 due to the results obtained during 2012 which included a 60 million pesos income to benefit Nayarit’s economy and almost 10 million media impacts promoting tourism to Riviera Nayarit. To follow up with the Governor’s leadership, Riviera Nayarit Conventions and Visitors Bureau met the organizing committee this month in order to start the works on the upcoming regatta. “The organization of high-endurance sports events allows us to reach a key niche market to attract tourism to Riviera Nayarit. In 2010 and 2012, the event resulted in a high number of visiting competitors from 28 countries, and provided the necessary conditions to promote our destination and to generate economic benefits for the People. In 2014, we’re expecting these benefits to be even greater”, stated the Director of the CVB, Marc Murphy. The Regata Copa México has the objective of promoting the natural beauty and the infrastructure of the Mexican coast, in order to increase tourism in our country, by reactivating the economy and supporting sailing. The Federal Tourism Secretariat, the Government of Nayarit, the Mexican Sail Federation, and the CVB of Riviera Nayarit will also support the event.